This article is about Haverhill (disambiguation). For other uses, see Haverhill, Massachusetts (disambiguation). Nickname(s): "The Queen Slipper City"
Located on the Merrimack River, it began as a farming community of Puritans, largely from Newbury Plantation. The land was officially purchased from the Pentuckets on November 15, 1642 (a year after incorporation) for three pounds, ten shillings. Pentucket was renamed Haverhill and would evolve into an important industrial center, beginning with sawmills and gristmills run by water power. In the 18th and 19th century, Haverhill developed woolen mills, tanneries, shipping and shipbuilding. The town was for many decades home to a significant shoe-making industry. By the end of 1913, one tenth of the shoes produced in the United States were made in Haverhill, and because of this the town was known for a time as the "Queen Slipper City". The city was also known for the manufacture of hats. Haverhill has played a role in nearly every era of American history, from the initial colonial settlement, to the French and Indian Wars, and the American Revolutionary and Civil wars. The town was founded in 1640 by settlers from Newbury, and was originally known as Pentucket, which is the Native American word for "place of the winding river". Settlers such as John Ward, Robert Clements, Tristram Coffin, Hugh Sheratt, William White, and Thomas Davis aided in the purchase of land known by Indians as Pentuckett. The land was purchased from native Indian chiefs Passaquo and Saggahew and permission was granted by Passaconaway, chief of the Pennacook's. Settlers, Thomas Hale, Henry Palmer, Thomas Davis, James Davis and William White were its first selectman. First Court appointments; given to end small causes were given to Robert Clements, Henry Palmer,and Thomas Hale. At the same court, it was John Osgood and Thomas Hale that were also appointed to lay the way from Haverhill to Andover. 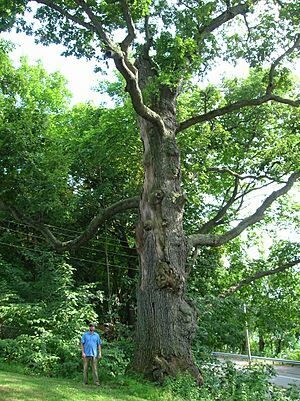 It is said that these early settlers worshipped under a large oak tree, known as the "Worshipping Oak". The town was renamed for the town of Haverhill, England, in deference to the birthplace of the settlement's first pastor, Rev. John Ward. The original Haverhill settlement was located around the corner of Water Street and Mill Street, near the Linwood Cemetery and Burying Ground. The home of the city's father, William White, still stands, although it was expanded and renovated in the 17th and 18th centuries. White's Corner (Merrimack Street and Main Street) was named for his family, as was the White Fund at Boston's Museum of Fine Arts. Judge Nathaniel Saltonstall was chosen to preside over the Salem witch trials in the 17th century; however, he found the trials objectionable and recused himself. Historians cite his reluctance to participate in the trials as one of the reasons that the witch hysteria did not take as deep a root in Haverhill as it did in the neighboring town of Andover, which had among the most victims of the trials. However, a number of women from Haverhill were accused of witchcraft, and a few were found "guilty" by the Court of Oyer and Terminer. One of the initial group of settlers, Tristram Coffin, ran an inn. However, he grew disenchanted with the town's stance against his strong ales, and in 1659 left Haverhill to become one of the founders of the settlement at Nantucket. Haverhill was for many years a frontier town, and was occasionally subjected to Indian raids, which were sometimes accompanied by French colonial troops from New France. During King William's War, Hannah Dustin became famous for killing and then scalping her native captors, who were converts to Catholicism, after being captured in the Raid on Haverhill (1697). The city has the distinction of featuring the first statue erected in honor of a woman in the United States. In the late 19th century, it was Woolen Mill Tycoon Ezekiel J. M. Hale that commissioned a statue in her memory in Grand Army Republic Park. The statue depicts Dustin brandishing an axe and several Abenaki scalps. Her captivity narrative and subsequent escape and revenge upon her captors caught the attention of Cotton Mather, who wrote about her, and she also demanded from the colonial leaders the reward per Indian scalp. Hannah Dustin remained controversial throughout her lifetime and remains controversial since the Native American Indians she killed and scalped in order to escape were allegedly not her original captors and among the people she killed were allegedly young children. In 1708, during Queen Anne's War, the town, then about thirty homes, was raided by a party of French, Algonquin and Abenaki Indians. Like most towns, Haverhill has been struck by several epidemics. Diphtheria killed 256 children in Haverhill between November 17, 1735 and December 31, 1737. George Washington visited Haverhill on November 4, 1789. Washington was on a "triumphant circuit" touring New England. Bradford Academy was established in 1803. It began as a co-educational institution, then became women-only in 1836. A temperance society was formed in 1828. Haverhill residents were early advocates for the abolition of slavery, and the city still retains a number of houses which served as stops on the Underground Railroad. In 1834, a branch of the American Anti-Slavery Society was organized in the city. In 1841, citizens from Haverhill petitioned Congress for dissolution of the Union, on the grounds that Northern resources were being used to maintain slavery. John Quincy Adams presented the Haverhill Petition on January 24, 1842. Even though Adams moved that the petition be answered in the negative, an attempt was made to censure him for even presenting the petition. In addition, poet John Greenleaf Whittier was an outspoken abolitionist. The Haverhill and Boston Stage Coach company operated from 1818 to 1837 when the railroad was extended to Haverhill from Andover. It then changed its name and routes to the Northern and Eastern Stage company. It was Ezekiel Hale Jr. and son Ezekiel James Madison Hale (descendants of Thomas Hale) that gave Haverhill a great head of steam. It was in the summer of 1835, the brick factory on Winter St was erected by Ezekiel Hale Jr. and Son. It was intended to run woolen flannel at a whopping six hundred yards of flannel per day. It was Ezekiel JM Hale, age 21 and graduate of Dartmouth College that came to the rescue when fire destroyed the operation in 1845. He rebuilt the mill at Hale's Falls, now more than twice as large produced nearly three times the output. Ezekiel JM Hale became Haverhill's Tycoon. EJM Hale served a term in the State Senate and was much revered in the area. Hale donated large sums of money to build the hospital and library. Haverhill was incorporated as a city in 1870. In the early morning hours of February 17, 1882, a massive fire destroyed much of the city's mill section, in a blaze that encompassed over 10 acres (4.0 ha). Firefighting efforts were hampered by not only the primitive fire fighting equipment of the period, but also high winds and freezing temperatures. The nearby water source – the Merrimack River – was frozen, and hoses dropped through the ice tended to freeze as well. A New York Times report the next day established the damage at 300 businesses destroyed and damage worth approximately $2M (in 1882 dollars). Bradford fits naturally into Haverhill but they were separate towns until January 1, 1897, when Bradford joined the City of Haverhill. Bradford was originally the western part of Rowley until it split from Old Rowley in 1672. In 1850, the East part of Bradford left and was founded as the independent town of Groveland. When Haverhill became a city in 1870, there were calls for the town to be annexed. This would go on for another 26 years. Neither town agreed to a plan, until in late 1896, the vote came up and both sides agree to join. There were many reasons for the decision. Finances played a part into the annexation; a lot of people who lived in Bradford had businesses in Haverhill and wanted lower taxes. Traditionalists wanted Haverhill to be a dry town as Bradford was. Businesses in Lawrence, Portsmouth, and Andover wanted Haverhill to be a dry town so more business would show up and increase businesses in those towns. The demand for municipal services like Hospitals, Schools, and a new Factory downtown were in Haverhill while Bradford had none of the three. The Bradford Center of town wanted to join Haverhill but the Ward Hill section of town did not at the time since it was a substantial distance from both Bradford and Haverhill. Finally, another reason why Haverhill wanted to annex Bradford was to return the town to majority English instead of the plurality of Irish, French-Canadians and Central Europeans (Hungarians, Slovakians, Germans, and Italians) it had become with the influx of mill workers. Haverhill gladly approved with the first ballot in 1870 and Bradford was no more starting January 1, 1897. Bradford remains the only town in the Commonwealth of Massachusetts to be annexed to a neighboring city other than Boston. Haverhill became the first American city with a socialist mayor in 1898 when it elected former shoe factory worker and cooperative grocery store clerk John C. Chase. Chase was re-elected to this position in 1899 but was defeated the following year. Haverhill was the site of the eponymous Haverhill fever, also known as rat-bite fever, in 1926. In the early part of the 20th century, the manufacturing base in the city came under pressure as a result of lower priced imports from abroad. The Great Depression exacerbated the economic slump, and as a result city leaders enthusiastically embraced the concept of urban renewal in the 1950s and 1960s, receiving considerable federal funds used to demolish much of the north side of Merrimack Street, most of the Federal homes along Water Street (dating from the city's first hundred years of development), and throughout downtown. Many of the city's iconic buildings were lost, including the Oddfellows Hall, the Old City Hall, the Second Meetinghouse, the Pentucket Club, and the Old Library, among others. During Urban Renewal, the iconic high school—the inspiration for Bob Montana's Archie Comics —was falsely declared "unsound" and slated for demolition. Instead, the historic City Hall on Main Street was demolished, and city began using the High School of Archie's Gang as the new City Hall. Urban Renewal was controversial. Several leading citizens argued to use the funds for preservation rather than demolition. Their plan was not accepted in Haverhill, which chose to demolish much of its historic downtown, including entire swaths of Merrimack Street, River Street, and Main Street. However, examples of the city's architecture, spanning nearly four centuries, abound: from early colonial houses (the White residence, the Duston Garrison House, the 1704 John Ward House, the 1691 Kimball Tavern, and the historic district of Rocks Village) to the modernist 1960s architecture of the downtown Haverhill Bank. The city's Highlands district, adjacent to downtown, is a fine example of the variety of Victorian mansions built during Haverhill's boom years as a shoe manufacturing city. In the 21st century, downtown Haverhill has undergone a renaissance of sorts. Housing trends, combined with a rezoning by the city led by longtime Mayor James Fiorentini and the use of Federal and State brownfield's money to clean up abandoned factories, resulted in the conversion of several abandoned factories into loft apartments and condominiums. There has been a total of $150 million in public and private investment in the downtown old factory district area. Additionally, the Washington Street area gained new dining and entertainment spots, and federal, State and local funds contributed to removing an abandoned gas station on Granite Street, cleaning up the site and converting it to a 350-space parking garage. The city was able to obtain Federal, State and local money to put in a new boardwalk and boat docks downtown. Recently, the city completed a rezoning of downtown proposed by Mayor Fiorentini designed to encourage artist loft live work space and educational uses for the downtown area. Despite the city's efforts, old buildings remain vacant or underutilized, such as the former Woolworth department store – boarded up for 40+ years at the intersection of Main Street and Merrimack Street. Recently a group purchased that building with the intention of redeveloping it, however those plans fell through. In February 2014, it was announced that plans were made to redevelop "Whites Corner" by demolishing the vacant Woolworth building along with other surrounding buildings including the former Newman's Furniture, Ocasio Building, replacing them with the new mixed-use project called Harbor Place. Those buildings along with other smaller ones were officially demolished as of March 19, 2015 making way for the construction of the Harbor Place project. As of July 23, 2016 the construction on the Harbor Place buildings are well underway as the mixed use building is near completion and the housing building is making progress. According to the United States Census Bureau, the city has a total area of 35.6 square miles (92.3 km2), of which 33.0 square miles (85.4 km2) is land and 2.7 square miles (6.9 km2), or 7.47%, is water. The city ranks 60th in the Commonwealth in terms of land area, and is the largest city or town in Essex County. Haverhill is drained by the Little and Merrimack rivers, the latter separating the Bradford section of town from the rest of Haverhill. The highest point in the city is found on Ayers Hill, a drumlin with two knobs of almost equal elevation of at least 335 feet (102 m), according to the most recent (2011-2012) USGS 7.5-minute topographical map. The city also has several ponds and lakes, as well as three golf courses. Haverhill is bordered by Merrimac to the northeast, West Newbury and Groveland to the east, Boxford and a small portion of North Andover to the south, Methuen to the southwest, and Salem, Atkinson and Plaistow, New Hampshire, to the north. From its city center, Haverhill is 8 miles (13 km) northeast of Lawrence, 27 miles (43 km) southeast of Manchester, New Hampshire, and 32 miles (51 km) north of Boston. As of the census of 2010, there were 60,879 people, 25,576 households, and 14,865 families residing in the city. The population density was 1,846.5 people per square mile (683.1/km²). There were 23,737 housing units at an average density of 712.2 per square mile (275.0/km²). The racial makeup of the city was 88.3% White, 4.5% African American, 0.3% Native American, 1.6% Asian, 0.03% Pacific Islander, 4.30% from other races, and 2.6% from two or more races. Hispanic Latino made up 14.5% of the population (5.8% Puerto Rican, 4.6% Dominican, 0.9% Mexican, 0.5% Guatemalan, 0.3% Salvadoran, 0.3% Colombian, 0.2% Cuban). 16.8% were of Irish, 14.6% Italian, 10.1% French, 9.0% English, 7.8% French Canadian and 6.3% American ancestry according to Census 2000. There were 22,976 households out of which 33.0% had children under the age of 18 living with them, 47.0% were married couples living together, 13.4% had a female householder with no husband present, and 35.3% were non-families. 28.6% of all households were made up of individuals and 10.3% had someone living alone who was 65 years of age or older. The average household size was 2.51 and the average family size was 3.11. In the city, the population was spread out with 25.7% under the age of 18, 7.7% from 18 to 24, 33.5% from 25 to 44, 20.4% from 45 to 64, and 12.8% who were 65 years of age or older. The median age was 36 years. For every 100 females there were 90.3 males. For every 100 females age 18 and over, there were 85.7 males. The median income for a household in the city was $49,833, and the median income for a family was $59,772. Males had a median income of $41,197 versus $31,779 for females. The per capita income for the city was $23,280. About 7.0% of families and 9.1% of the population were below the poverty line, including 12.3% of those under age 18 and 10.0% of those age 65 or over. 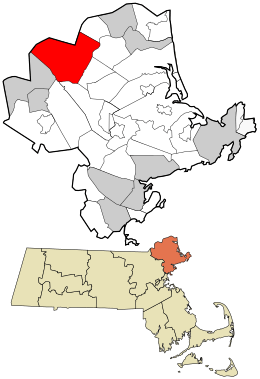 Haverhill, Massachusetts Facts for Kids. Kiddle Encyclopedia.